The focus of our laboratory is the understanding of basic mechanisms that regulate the fate of stem cells within tissues. We are currently studying adult epithelial stem cells in the skin, with special emphasis on hair follicle and the inter-follicular epidermis stem cells using cell culture as well as human and mouse skin as model systems. Epithelial stem cells respond to homeostatic and injury signals from their niche to regenerate the tissue. We are analyzing the physiological role of several genes implicated in different aspects of stem cell activation, self-renewal, and differentiation. Our general focus is on stem cell fate choice by epigenetic regulation, transcription regulation via specific developmental transcription factors, and chromatin modifying factors. We are particularly fascinated by the role of epithelial stem cells in organizing their surrounding environment, such as blood vessels, nerves, fat cells, and fibroblast, and how they play a role in building and remodeling tissues. 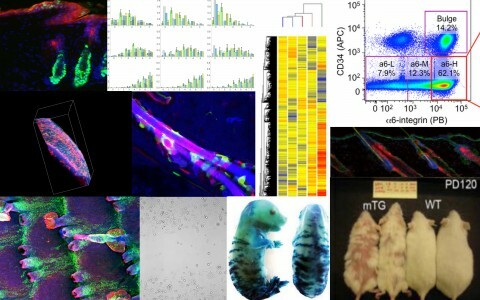 Additionally, we recently began to explore the potential implication of our genes of interest in cancer and to examine in more detail the translational relevance of our work to human skin disease.